A decade ago, a landmark study by Indian law affairs specialist Rupert Ross suggested that alternative methods of crime prevention based on traditional Aboriginal values would lower crime rates in Native communities. Since then, reform measures that have been implemented have resulted in fewer criminal charges, less vigorous prosecution, and shorter jail terms for Aboriginal offenders. Unfortunately, such research and reforms have often failed to address two groups greatly hurt by criminal violence: women and children. The impetus for this book arose out of a 1995 Winnipeg study involving twenty-six Aboriginal women. The compelling accounts these women give of the domestic violence they experienced, first as children and later as wives and mothers, make it all too clear that any plan to implement diversionary reforms must first take into account this under-represented group. For survivors of domestic violence, jail terms for abusers allow time for healing, and the threat of criminal prosecution may quell violent outbreaks. Lax responses from an inconsistent criminal justice system often put Native women at risk. 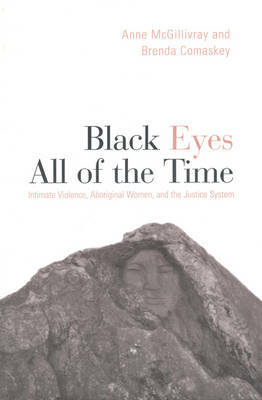 Drawing on the experiences and views of the women affected, Black Eyes All of the Time analyses how this pervasive cycle of violence evolved and suggests possible solutions involving both the dominant Canadian justice system and Aboriginal traditions.